On Feb. 18, NEP Australia will open the Andrews Hub, an all-IP production facility that will be connected to more than 29 stadiums across the continent. Comprising a hub in Sydney, opening Feb. 18, and one in Melbourne, opening in March, the Andrews Hub lays the foundation for a new era of sports production in Australia. And, while final construction and testing has been taking place, the NEP Australia team managed to complete an on-air test from a temporary facility where the production team was 900 km (more than 500 miles) from the venue. 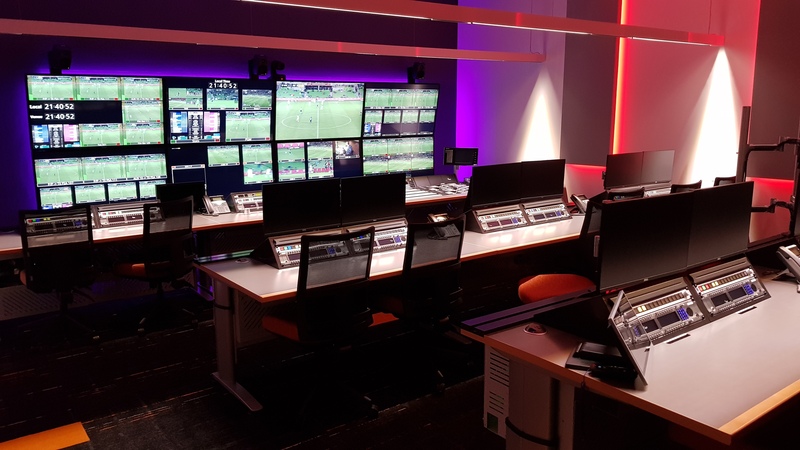 The temporary hub, which was set up at the Sydney facility, housed the production team — director, technical director, audio director, graphics and replay operators — for a Hyundai-A League soccer match taking place about 560 miles away in Brisbane. During the broadcast, live uncompressed HD signals from 10 Sony HDC-4300 4K/HD cameras, including high-frame-rate units, were sent from the venue to Sydney via NEP’s new countrywide Distributed Production Network (DPN), with a fully redundant network at 50 Gbps. The production relied on ST 2110 and IP to deliver a live event to air in uncompressed HD, an industry first. Each control room has a Sony XVS8000 production switcher, a Lawo mc²96 audio console, RTS intercoms, EVS replay systems, and a Boland true-UHD monitor wall. Resources shared between the Sydney and Melbourne hubs include two Arista 7508R eight-slot network switches, each in a hitless configuration; a Lawo V_Matrix for core WAN gateways, processing, and multiview; RTS intercoms; IHSE IP-based KVM; and VSM control. A proprietary video-conferencing system developed by NEP also plays a key role, and Telstra is handling DPN connectivity to 29 of the venues, with several additional venues connected by dark fiber. But the success of the facility will ultimately be about people, not technology.